I am rather fond of Suburban Tomato's Top 5s. It's a nice sort of discipline - thinking about the top 5 things. With little being picked from my patch, I started thinking about the things that I rely on in my veggie gardening and that are actually gardening friends. Here are my top 5. Rain, hail or shine my hat is a vital garden tool. Rabbit felt hats are not only good at keeping the sun off your head, but are very water repellent when you want to garden in light rain. Perhaps most importantly, because I have fair skin (and skin that is currently having some treatment for pre-skin cancers despite being 'careful' for many many years) my hat is not only a fetching addition to my garden style (I am joking), but it is essential to preventing as much skin damage as possible. This is quite an old hat. It first belonged to my lovely husband but the hat shrank a little and so it was passed onto me. I don't mind hand-me-downs. The black band I made from some lovely black silk thread I bought when we visited a Tibetan part of Gansu Province in China many years ago now when the hat still belonged to my husband. The silk thread (it came in black and a vibrant red) was used by Kampa Tibetans as an addition to their long plats. I can distinctly remember sitting on the verandah of a fabulous Tibetan-styled rustic courtyard hotel and making it. The feathers are from a cockatoo and a kookaburra found some time ago while bushwalking. It has two holes in it now and the felt is a little dry and scratchy, but it will keep being used till it dies and then it might become a rabbit and silk addition to the mulch under the lemon tree - a fitting place of rest. Handy little friends, these are. With these in your hand you feel like you are a real gardener ready to conquer the world! They are almost always in the garden with me. What would my espaliered limes be without my secateurs? You can see that they are pretty dirty. I keep reading gardening books that say I should be cleaning them, but I don't. This brings such joy. I love the crack of the cane when it is weighed down with a basket full of lemons, I love the polished handle in my hand. I love filling it with my home grown produce. This is an old bread knife. I suspect that it may have been given to me as a leaving home present - you know the pile of things your mother gave you when you first moved out that were her cast-offs (I mentioned I don't mind hand-me-downs). It was a perfectly good bread knife so I am not sure how it ended up being a garden friend, but it is very helpful for cutting broccoli heads, cutting string for ties for staking, sawing thru giant stalks of spent sunflowers and cutting up the hard stems of the broccoli to include in the compost bin. It has a lovely wooden handle that has lovely grain markings. It feels very nice in the hand like all knives should feel. I discovered the joys of these screw on tops when we lived in England and I first started raising seeds in my little green house. They screw easily onto the tops of mineral water bottles and deliver a little gentle spray of water ideal for your seeds and seedlings. I was delighted to find these available from the Diggers Club when I returned to Australia. I want to throw in another thing , not really becasue they are part of a top 6 but becasue I like the picture so much. What are they? Twist ties! In accordance with that great Australian tradition of keeping furniture on your verandah, we have a lovely hat rack on the back veranda. It is a handy place to store my twist ties (and my hat). What are your favourite garden friends? The things that reliably assist you in your patch? Things that you'd find it hard to do without ? The produce is getting a little thin right now. All the broccoli have been taken out cause they had stopped producing side shoots. The caulis and cabbage are at their end too and are on the smallish side (see Whiptail, shade and cute veggies). There are some snow peas yet to come and another lot of seeds has just gone in the ground, but I will have a considerable gap in my supply of those greens. I do have a pile of rocket ready to eat and a few fennel a few weeks off, but the beds are consequently pretty empty and ready for another planting. Last week I started raising some red bok choi and despite the fact that it rained most of the week, they have already come up (just their baby leaves). But the lemons just keep on coming... maybe a Lemon Delicious pudding this weekend? Another bottle of Lemonade / lemon cordial? I love old aprons. They are are softened by years of use and come in wonderful prints of years gone by. I have a couple of old ones that are real favourites, but I have also started to make new ones, inspired by the old ones and made with the exact same measurements. Here is my latest new apron. Its a lovely pink and black cotton fabric that I bought around 12 years ago. There is something about the print that looks a little retro. It's bound with black bias and has a pocket and waist band that is made from the patten on the edge of the fabric. Here is the original old apron that has the softest of fabric. I like to think my new ones will give as much service and joy as this old beauty has. I wonder how many meals my old apron has cooked, how many hands have been rubbed clean, how many faces it has wiped? This post is linked into My Creative Space. I have only recently discovered the joys of cabbage. I really didn't like it much for a very long time. I suspect it was all that coleslaw that was eaten in Australia in the 70's, drenched in dressing from a jar and as an accompaniment to overcooked meat from the BBQ. It was enough to put anyone off not only cabbage and BBQed meat, but tongs, summer, swimming and family outings (and lawn mowers... but that's a long story!). I am sure there are many of you that remember that era, do you remember the burnt-to-a crisp steak, so tough your teeth couldn't cut thru it? The greasy lamb chops and the fat, pale, insipid pork sausages with no texture at all? The days when WASP Aussies complained about the smell of garlic and the taste of coriander? When the only ginger you could buy was pickled and came in a jar from somewhere in Queensland? About the only good thing to come from that era is the shandy (a beer and lemonade mix that was only drunk by women) and the pavlova! I still like a shandy when it is very very hot. I am sure that whole eating experience started me on my path of making my own dressings and mayonnaise. I can't remember the last time I ever bought a jar of those terribly expensive concoctions. It also made me a vegetarian for a long time until trimmed meat turned up in the butcher shops and sausages went gourmet and continental...how the world has changed. Thank goodness! Back to the point... learning to enjoy cabbage. I think my like of cabbage began with trips to China. I discovered that there were different types of cabbage ( fancy that! And other ways to eat them other than dripping with dressing!). I don't grow Chinese cabbages (yet) but I do grow savoys which are not soccer ball hard and which have softer flavours and softer leaves like the Chinese ones. One of my fav things to do with my home grown cabbages is a very simple dish which approximates a dish I had in China, best of all, it has loads of home grown produce. Chop garlic, chilli, spring onions and bacon finely. Place in the work and fry the herbs in the oil that comes off the bacon. When bacon is cooked and oil hot, add a small amount of sesame oil and some olive oil if you need a little more. Add cut cabbage and stir fry. At the end add a splash of soy sauce and serve. We are so lucky to have lots of birds visiting our garden. When we got here 7 years ago, there was no life in the backyard except loads of grass. Over time we have not only built our veg patch but we have also developed a great native Australian garden full of local Cooks River plants. It's been a pleasure to see them grow and develop but it has been an even greater pleasure to see the native birds increase in variety and number as the local plants matured. A list of the birds that visit and fly past is on my Wildlife pages. The Rainbow Lorikeets have been especially fun additions to the backyard. They are so gregarious in both temperament and feather. Last weekend was really wet and the lorikeets used the back verandah as a spot to dry off. They came in really wet...poor things. This photo is blurry because the where shaking themselves to remove as much water as possible. Then when they finished shaking themselves they began grooming themselves. Then they spent the next little while grooming each other. We couldn't stop taking photos of them. Then last week a family turned up and 'occupied' the bird feeder - two adults and two babies who, once they could manage to get from the tree into the feeder, sat in the middle and squawked to be fed. Notice how the babies have black eyes and darker beaks and the adults red eyes and red beaks? We were perplexed as to why they would have big babies at this time of year. I do like a one-pan wonder. Does anyone else use this term to describe a meal that is all cooked in a baking pan in the oven? They are easy to assemble, the flavours meld really well, they take no effort to cook and they can come in endless varieties. Tonight I took advantage of my pickings and made a chicken, fennel and lemon dish. It's totally from my head which can sometimes mean 'disaster imminent' but not on this occasion. Add the olive oil to the baking pan and heat in the oven. When warmed, add quartered onions and quartered potatoes and get baking. While cooking prepare the fennel bulb by cutting into chunky slices and washing to remove any lurking dirt. Put in a bowl and add a little lemon juice over the fennel to stop it browning. Mix and add to the pan. Smash up the seeds and pepper in a mortar and pestle to a textured rub, add the chilli flakes and mix. Pat onto the chicken thigh pieces. Add the chicken pieces into the pan keeping all ingredients in one layer in the pan. Cut the lemons into 8ths and squeeze over meat. Tuck in the pieces of lemon close to the chicken. This is pretty yummy. Initially I was just going to make a lemony chicken dish but the lad's suggestion of adding fennel inspired the dry spice rub and t'daaa! I will make this again. It somewhat borrows from my Roast chicken and lemon dish, but that is the beauty of a one-pan wonder isn't it? Endless variation? Finally a sunny day! We have had lots of rain in Sydney and it's been hard to get into the garden. Today I made up for it. There were a few patches in the garden that needed filling and, as I had been away for so long, I didn't have any hand raised seedlings to go in so I picked up a few seedlings from the local nursery. I also did a lot of picking, the pick of lemons will turn into cordial later today. But take a look at the picture at the beginning of this post, is something wrong? Looks a bit weird right? Either the snow peas and some of the chillies are massive or the brassicas are tiny. Well the chillies are massive - they are my long cayenne which are still producing, and the broccoli heads are tiny, but they are the side shoots that come up after the main head has been removed. But the other brassica are tiny.... but aren't they cute? Cute they may be but the result of two different problems in the patch this season.... too much shade for some of the veggies and not enough lime. My patch isn't huge and the soil over a number of years has built up quite nicely so in general I can get away with packing the bed pretty full, that is provided everything gets a little sun. But unfortunately most of my savoy cabbages didn't get enough and the plants are all pretty small. This little fella above is of the smallest of the plants. I figured it wasn't going to come to much so it got picked. And what of the caulis? Too much shade too? Well some of the plants got a little less light than I would have liked, but the main problem was a case of whip tail. Whip tail is a molybdenum deficiency that apparently is exacerbated by insufficient liming of the soil. I read somewhere one day that Australian soils a pretty deficient in this micro-nutrient anyway, but not enough liming makes it harder for the plant to utilise what there is in the soil. As a result the plants don't grow strongly, they get a twist in their leaves and sometimes the leaves get thin and whip like (not my problem). A bad case results in no heads at all. I guess I am lucky I have these two little babies.There are a few more plants in the garden but I think I will be lucky if I get anything more than heads this size from them. But they might be cute steamed whole? They'd look cute on the plate? I could of course just say that it was all deliberate and that I am cultivating cute baby veggies! Not a particularly cold evening, but nonetheless a bean feed was in order. Tonight's bean feed was a chickpea and chorizo dish. This one is adapted from a recipe which appeared in Gourmet Traveller April 1999 which had a Spanish theme. It is an absolute favourite. I have put the recipe here as I now use it rather than as originally published. It is such a favourite that I don't use the recipe any more, it's just in my head. Cut capsicum into pieces and grill until skin is black, sweat in a plastic bag and remove skins. Cut into rough pieces. In the meantime brown chorizo and once oil released cook onion and garlic. Drain chickpeas and add to pan with tinned tomatoes, chillies, rocket fuel, spices and bay leaves. Cook on a low heat until the flavours have melded. Serve with a sprinkle of oregano and parsley. Another wet, damp, drizzly, mizzly day. I was in serious need of winter warming food and a pair of socks after spending the day with wet feet after discovering a hole in the bottom of my shoe! I was going to make my chick pea and chorizo stew for dinner, I was thinking about it on my walk home in the rain, but as I walked in the front door I realised that the lad was making meat pies! Yum. The lad makes a mean meat pie. Well actually they are not mean at all. They are generously full, generously tasty and generous in the time taken to make them. The lad makes the filling from beef cubes, carrot, celery, onion and herbs and cooks it down a long long way. Then makes his own shortcrust pastry for the bottom and blind bakes. The pie is then filled and topped with shop bought puff pastry. Here are tonight's six pies, straight from the oven and steaming up the lens. And to somewhat compensate for the meagre home grown ingredients in the pie, we ate them with home grown snow peas. One of the great pleasures of winter is beany, soupy, stewy things. They are the kind of food, like good porridge and risotto, that warm you from the inside out. It was a cold for Sydney (max 14c) and drizzly wet day yesterday (and is again today) and so I decided to make a beany thing. It all started by me remembering that, way back in the cupboard, was a stash of home grown dried beans. I have two jars of a former season's dried beans. I didn't dry any of last summer's beans, I guess I didn't need to considering I had two jars! I tend to dry my beans when I have been away on holidays from the garden when the beans are in full flush and come home to beans too fat and bulging to be nice to eat green. I don't let them go to waste though and pick them off just before they are fully dry and do the last bit of drying on the back verandah and then jar them up. The two jars are of two different beans. One is a lovely brown skinned bean. It was a green bean, but do you think I can remember which? I am serially bad at noting varieties, its something I need to change. The other jar is the dried bean of a climbing borlotti. It dries a two-toned brown rather than lovely red and cream pods they come from. The original seeds came over the fence from the Italian-origin neighbours. The pods were red and cream - just like normal dwarf borlotti beans. I made a beany, soupy thing out of the brown beans. Soak beans overnight. Drain and put on to boil until cooked a long way thru they don't have to be totally cooked cause you will cook them in with the rest of the ingredients. Brown the lamb shanks and discard any excess unwanted fat. Sweat onion, garlic carrot and celery in the same pan that you browned the shanks in. Add all ingredients into a large saucepan and cook on a low heat. Eventually the meat falls off the bone, remove the bone and any of the bits that you don't like.When the beans are cooked thru serve with toast. I am contributing this recipe to Greenish Thumb's Garden to Table Challenge. But what's your favourite beany thing to eat during winter? Are you a chilli con carne fan like myself? Which beans to you grow to dry? This entry is a few days old now. You know how it is, you come home from a long trip away and there is so much to do, it takes a while to get back into the swing of things. Oh the joy of a heavy basket, the first pick after a long time away, the pleasure of dirty hands! Come to think of it, most days the garden inspection is the first thing I do when I come home. It's a great way to wind down a stroll thru the patch. Do you dive into the patch when you get home from work? And the joy of the first home cooked meal with your produce. I took advantage of the pick and made this veggie dish to accompany a rack of lamb and roasted roots. Add chilli and garlic to olive oil in pan and cook on. Add fennel and cabbage and wilt and mix with other ingredients. Keep it slightly crunchy to serve. Just before you serve, squeeze a little lemon juice over and a grind of black pepper. Take a look at Daphne's Dandelions for harvests from across the globe. Autumn has ended and I have missed about 2/3rds of it being away overseas for work – see Garden Glut International. Autumn in Australia (at least in the southern states) is defined by the calendar months March April and May and in my opinion is the loveliest time of year in Sydney (but come to think of it, I think autumn is about the loveliest time of the year just about everywhere I have ever been!). So what can I say about autumn if I have been away? Well most of this is from the reporting of my David who has been giving me great updates. Its been a weird autumn...Just as our summer was cool and wet, this autumn has been the summer we never had, followed by heavy rains and the impact on the patch has been profound. Here is some of the things that have happened as a result. • Eggplants - normally pulled out in February/ March continued flowering and flowering and were finally only pulled out in mid-May. The fruit were smaller than they had been earlier in the season, but I guess that can be explained by all the hard work they put in, no doubt depleting the store in the soil. Must feed up those parts of the patch. • The Chillies too have been long producing...in fact I still have two plants in and the long cayenne still has loads of green chillies on the plant. Again I normally pull them out in around March. Even though we don’t get a frost in Sydney (at least in my part of Sydney) I don’t over winter them. I only have limited space and I remove them when they are past their best to free up the bed. Frankly I don’t think I need to grow any chillies next summer, what with the stash ‘preserved’ in oil, in vinegar, in rocket fuel, in sweet chilli jam and frozen could keep me going for two years. But I KNOW I will grow them again next summer, they just brighten up the garden so much. And besides which I can always use the excuse offered by Suburban Tomato in her value space rating blog - they are just too efficient how can I not grow them. • Brown berry tomatoes - just when I thought they were finished in Feb and when I had pulled all, the other tomatoes out, they revived and started flowering heavily. They have produced small crops – a punnet at a time and are only now giving up the ghost. 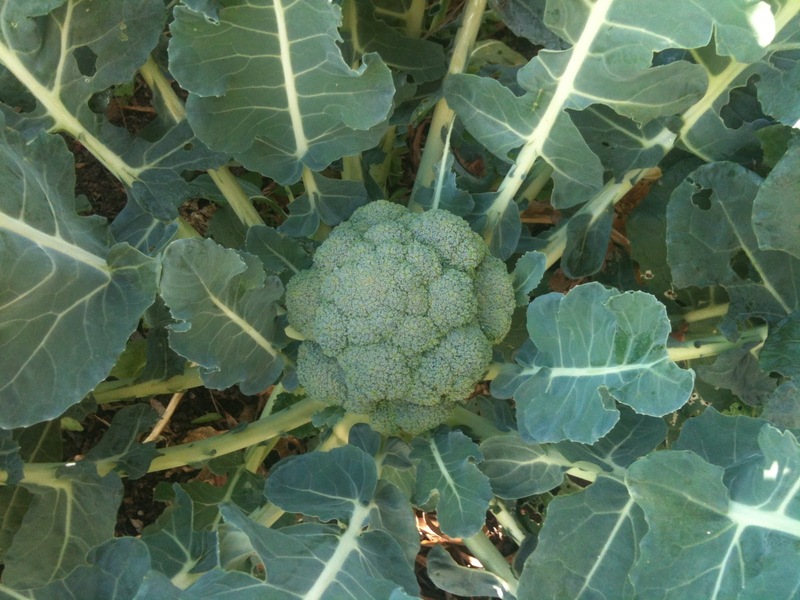 • The Broccoli that I planted in February were producing great big heads in early May. Quick hey? Must have been all that sun they had. All the big heads have been picked and now its the side shoots to keep us going. 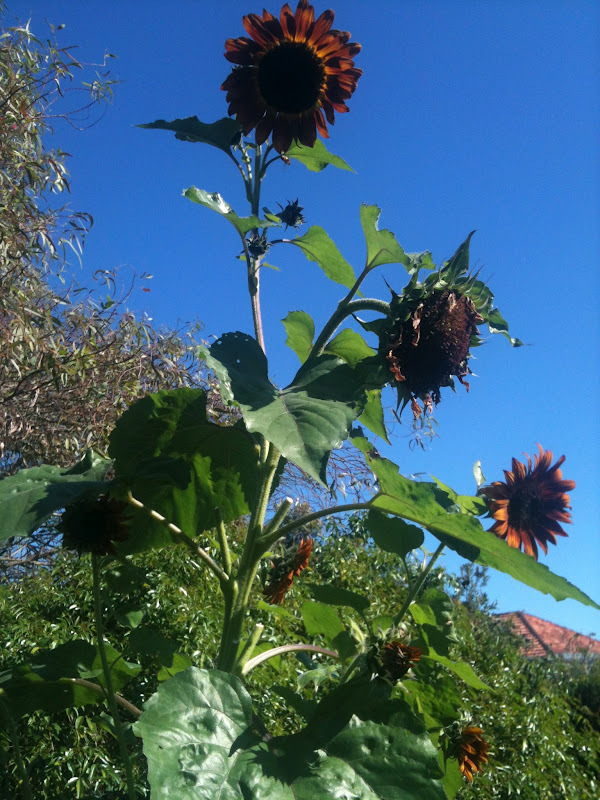 • The Sunflowers that self-seeded in the broccoli patch and which I left to see what happened grew and grew and produced lovely browny heads. In May they were towering over the patch and there were plenty to cut to bring inside. I normally pull my summer sunflowers out when they are spent and they don’t normally go about sprouting until the next late spring. I will probably take these out of the garden this weekend. They have pretty much finished now. • Snow peas that were planted in February behaved pretty much like they always do, they started being picked in early May. They are heaven on a stalk. We pick every second day and pretty much eat everyday. There is nothing better to eat veg-wise in my opinion in a winter veg garden. Crunch, sweet, best eaten at the vine. All this resulted in some interesting harvest baskets – a great combination of summer and autumn veg. Spring onions – I just planted too many to keep up with! With the lovely man home alone there was only so much he could eat so much of the glut was distributed to friends and family for their consumption. Cabbage - with a booming broccoli crop the savoy cabbages got a little shaded. I also suspect I had another issue... the cabbage went into the patch where the eggplant were. I had had a great eggplant year and I suspect that the eggplant had really taken a lot out of the soil. I did top it up before planting the cabbage seedlings, but I suspect not enough. Beetroot - these too got a little too shaded by the monster broccoli. I got some but only small roots. This all comes from having only a small space and big ambitions and planting thickly to cover ground and get the most out of the patch. Radish - these failed pretty spectacularly I suspect it might be because of two reasons - I didn't thin them enough, and they may have been overshadowed by a very prolific rocket crop. Cauliflower - hmm, big failure - serious whip tail... I have always had a little bit of whip tail but always had good strong heads. This year I pushed my luck and have paid for it. If I get any heads at all they will be tiny. Lesson? Don't ignore micro-nutrient deficiencies! The other big learning of this autumn, was how well and how enthusiastically my darling husband tended the patch while I was away. Grub squashing, compost emptying, path clearing, plant feeding, pulling out when veg had finished, harvesting and taking photos and sending them to me to make me think of home.